The one thing that you can predict – is that the late winter period can always be unpredictable! Either it’s really cold, really windy, or really wet. This year we have had a bit of each, but lately it has been windy, very windy, as storm after storm battered the UK. Now you can usually find somewhere to fish when it’s like this, but it is always a compromise. Unfortunately most of the waters I am concentrating on at the moment are boat- fishing orientated. Yes, you can fish them from the bank, but, in reality, this is tough going, especially with lures. 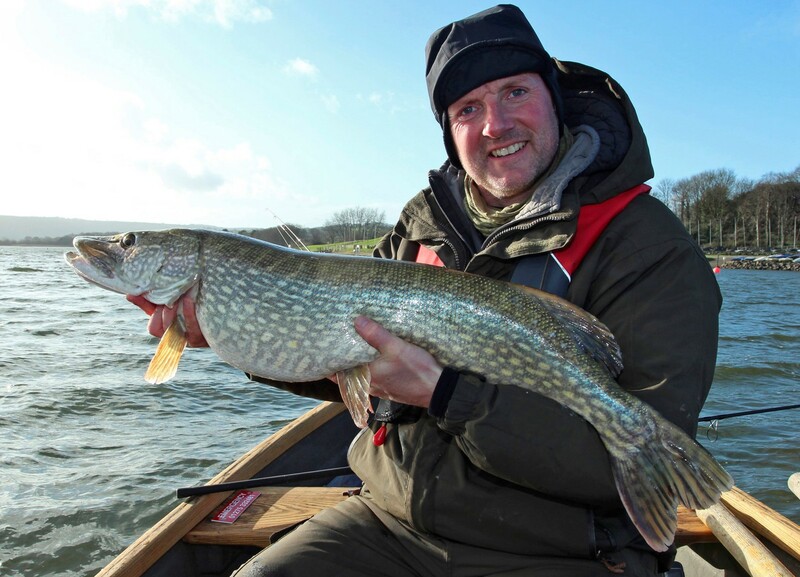 In boats on big waters you are at the mercy of weather fronts, most places won’t let you out if it’s too windy, and even if it is not at that level I find anything above 18 mph is quite a waste of time, as you simply don’t fish effectively when it’s at this speed. 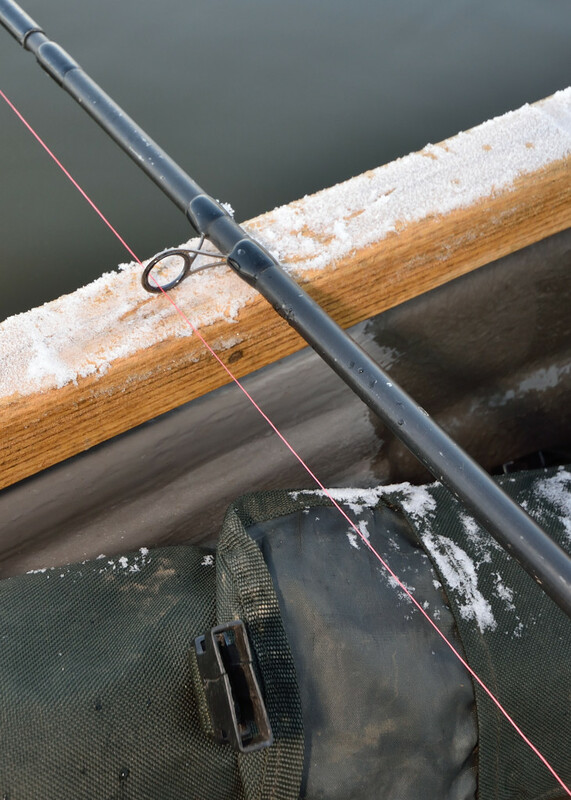 Yes, you can throw a drogue out and cast in front of the boat, or jig behind it hoping to come across something, but that is what boat fishing was 10 years ago, technology, boat control and fishing methods have evolved exponentially since then, and the only thing that scuppers these advantages is the wind! What this means is that you need to pick your days to go out, – which can be frustrating, but you just have to go when there is a gap in the weather. I took advantage of a brief respite in the weather recently to get out on one of my favourite waters. It had been blowing a gale the day before, with a strong west wind churning the water up. Usually at this time of year the fish can be found quite deep, but it has not been a typical year, and the last few times out I had had fish in relatively shallow water. However after the best part of the morning covering all the usual spots, I hadn’t seen a single fish. I had to leave just after midday so in desperation I decided to try an “Autumn” spot that I had GPS marked. The wind had been pushing into this spot all the previous day, and there was an interesting shelf / gully feature where sometimes pike sit on. As I went over it I could see a few interesting “blobs” of small prey fish on the finder, and then the long yellow tell-tale arch of a good pike sitting just off them. Setting up the drift I flicked one of the new Svartzonker McPike lures out and let it sink before cranking it back over the fish, and bang, first time. 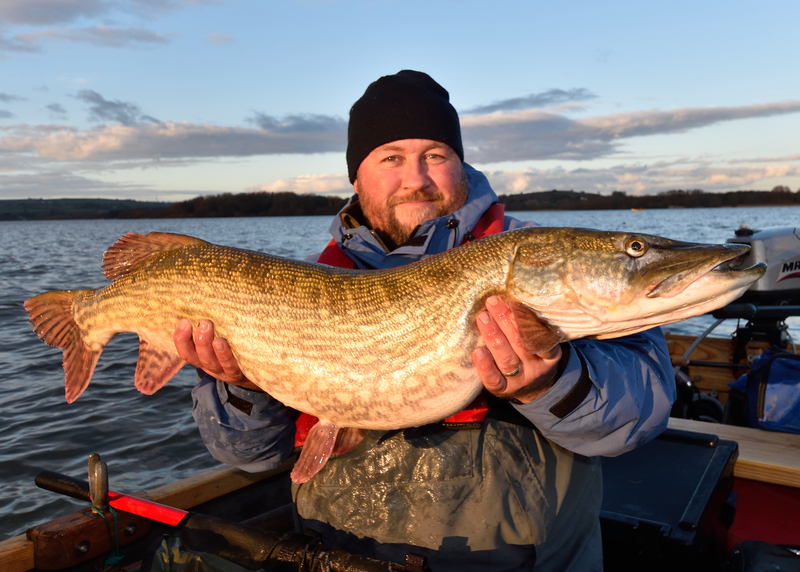 If pike are feeding you don’t need to mess about with them, put a lure within 6ft and nine times out of ten you will get a reaction. This fish fought really hard, swinging the boat around at one point, which is typical of shallow water feeding fish. Unfortunately it decided to monsoon just as I netted the fish, so managed to get everything soaked just before I had to pack up, including my camera kit, but, with a nice 20 in the net I wasn’t bothered at all. When you catch a good fish, you have to have a few more casts, and I did – in fact I had an extra couple of hours’ worth, which completely threw me off schedule for what else I had planned that day – but needs must! I would like to say that it paid off, but I didn’t have or see anything else at all, I just got even wetter for my troubles. But one hit, one fish, is a good average. Even though I had to drive home with my camera drying out in the foot-well with the heating on full! 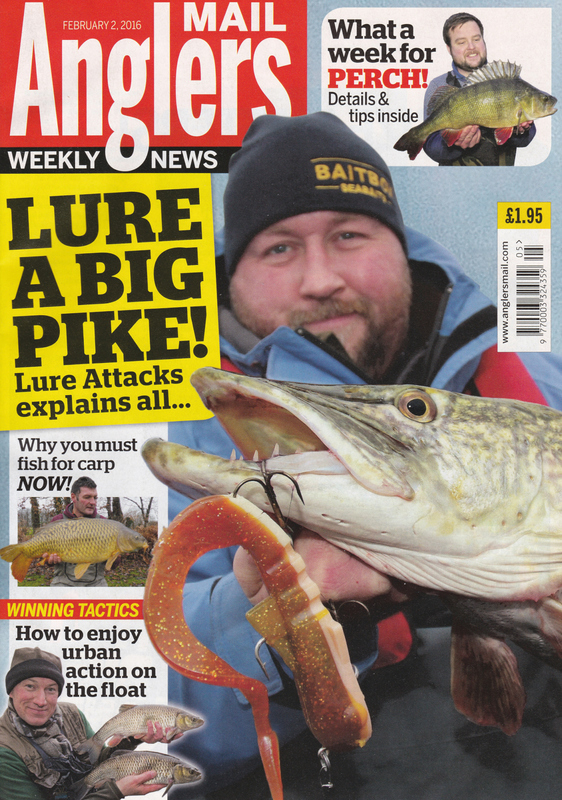 Recently I wrote an article for “Pike and Predators” magazine with the rather big-headed title of “Best way to catch a thirty” Now this caused a bit of a stir on social media, and it turned out to be a bit of a “marmite” article with some anglers stating it was the best work I have ever done and with others suggesting that there isn’t a best way to catch a thirty, you just have to fish the right waters. Well yes that is quite obvious, you can only catch what is in the water in front of you. But if you look at it with a robot- like analytical mind there are trends that are shown. Obviously most thirties are caught on baits, simply because the majority of anglers use baits, this however doesn’t make baits the most effective way to catch them, and I stand by that. 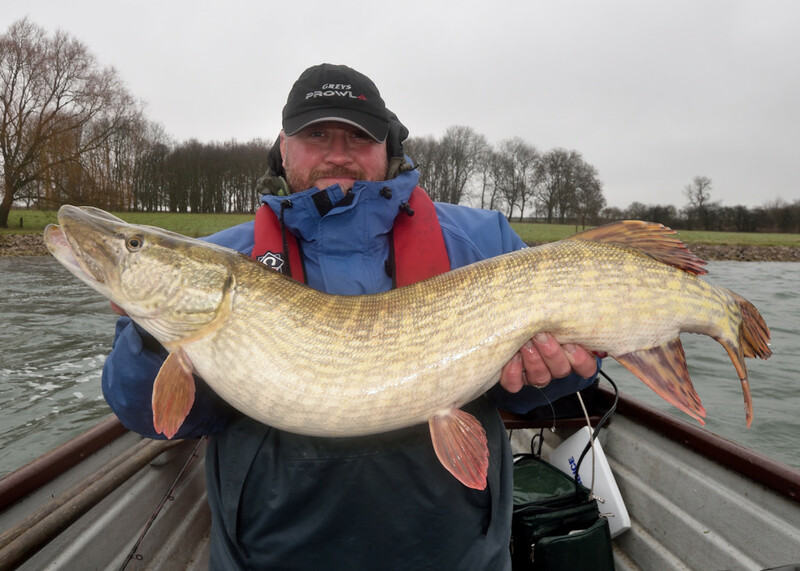 There were also a few anglers who suggested that catching thirties wasn’t the be-all of pike fishing – and I can understand that, fishing is personal and means different things to different people. Some like just catching anything, some like catching big fish, some like being out with their mates. Personally I like catching big fish, that is where I am at, and if I never saw another jack I would be happy, and because of that I only fish waters where there is a potential for big fish! 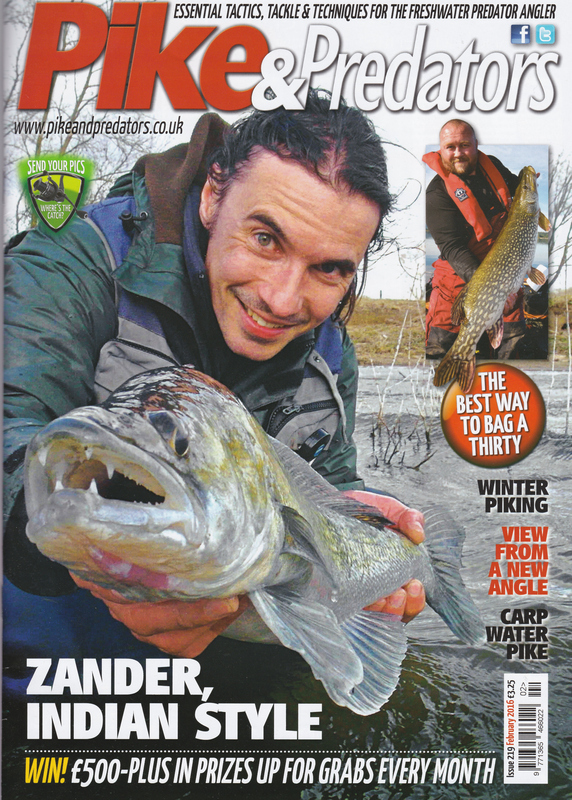 You will remember that in my last blog I was upstaged by a Gudgeon on the cover of Anglers Mail, well it looks like there may be a theme going on here somewhere when it comes to covers. Which leads me to another bizarre type of fishing. Recently I bumped into a chap fishing on a canal I was looking at, who was dressed in reds and oranges with more fishing advertisements on his clothing than a Nascar driver. As it turns out he was wearing all the branded stuff out of his own volition as well, he wasn’t paid to wear it! He was effectively drop-shotting with 3lb line with rubber maggot- like grubs and catching 2 – 3 inch perch, sometimes three a chuck. I watched him for a while and went to have a chat. Turns out he had been there for about 2 hrs and had caught 131 “wasps”. “Wasps ”, as it turns out, are micro perch! And he had certainly caught 131 as he showed me his “clicker” where he recorded each one! 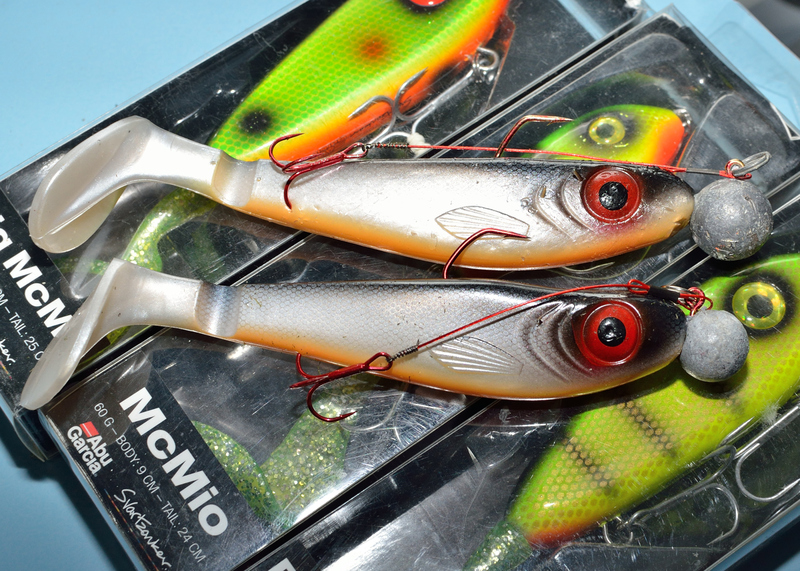 Now why anyone would want to catch micro perch is beyond me, let alone catch three at once, let alone have the presence to count each one on a clicker! As I say fishing is different for everyone. I, however, am a grown man, so I went off looking for some pike, which didn’t materialize, but at least I didn’t get stung by any wasps! The next day I was meant to be at Chew for the first day of its 2016 opening, but, alas, the wind put an end to that, as the boats were all canceled. The enforced “day off” was much needed and gave me time to re-rig a load of lures and tie up two bins worth of traces ready for the next day, when I was back on there with Paul Garner. I pulled into the car park with trees being almost bent double, it didn’t look very promising at all. In fact I was debating if I should even bother carrying my gear down to the jetty, as I was sure we wouldn’t be let out. But, as if by magic, as I took far too much kit down the steep hill the wind died, almost completely, just as the BW staff turned up – so it looked like we were going out after all! Paul and I had a cracking day, with loads of fish, however no real big ones for Chew. I managed a 21 which I was more than happy with. Paul had a 19lber and we had around 10 – 12 other fish as well, mostly on lures, but a few on deads. The reason I switched to lures was that I was having loads of dropped runs on baits, that I put down to jacks, but who really knows. Chew being Chew, threw up the usual handful of really big fish that always get caught nowhere near where you are fishing! But it was a good day – even if the wind did get up to gale force level just as we were moving spots, meaning our anchor wouldn’t hold where we wanted to fish, and we got broadsided by a wave which soaked me – with the water hitting me so hard on the side of the head it gave me a case of swimming pool ear till the next day! A couple of days later Paul and I were out again, soaking some deads in an area slightly deeper than most were fishing, simply because we were convinced that the big fish were still deeper than most had thought. This proved to be the case, as, when moving over to the spot, I saw a huge fish on the sounder. Such was the size of the fish that I dropped my bait on top of if before we had even anchored! But, alas, it didn’t help, as I didn’t even have a bite. A little while later further down on the same “line” as us Carl Garret struck into a good fish, I watched him play it and then struggle to get it in the boat. It looked massive! Carl was on his own that day and we could see it was a bit fish so we upped anchor and went to help him, and I am glad we did! That fish was 41lbs! When you see a fish like that you realise you are looking at the next echelons of pike, twenties look bit, twenty five’s look bigger, thirties always look massive – forties are exceptional, it wasn’t just the length of the fish that got me, though it stretched from one side of the boat to nearly the other, but the depth. I made Carl take a photo of it on his unhooking mat, as it was such an exceptional fish when laid out like this. Paul swapped boats and took some great photos of the fish for Carl. 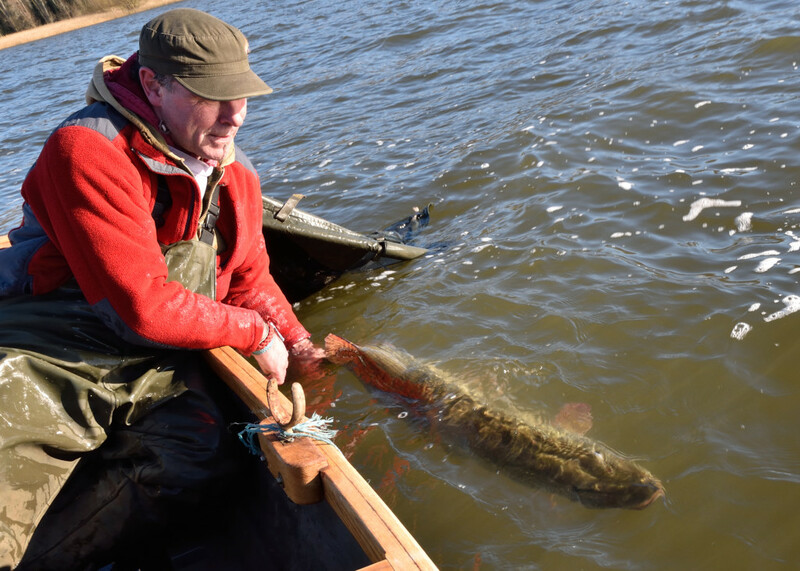 I held the boats together and watched, thinking that it is now the third time I have been on Chew to have the boat next to me catch a 40lb pike – which you can take two ways, either I am quite unlucky, or that I am in the right area each time so my watercraft is good – which is what I would like to think! Anyway we chugged back over to our original spot and I spent the next couple of hours alternating between dead baits and Lures. I was so sure I was going to get one on a lure that I kept at it even though I hadn’t had a hit all day, then right a last knockings bang a lump hit it as I crawled the lure back up to the boat. Kicking Paul awake he netted the fish first time and then left me to unhook and weigh it while he whipped his lure rod out and had a few sneaky casts! In all fairness he did as usual take some excellent photographs in the fading light, but that was it, one hit one fish – again! After that it was off to The Blue Bowl to celebrate Carl’s fish with a couple of pints, I think we stayed longer then we should have and I spent most of the time fighting to keep Kev Shore away from my fish and chips! 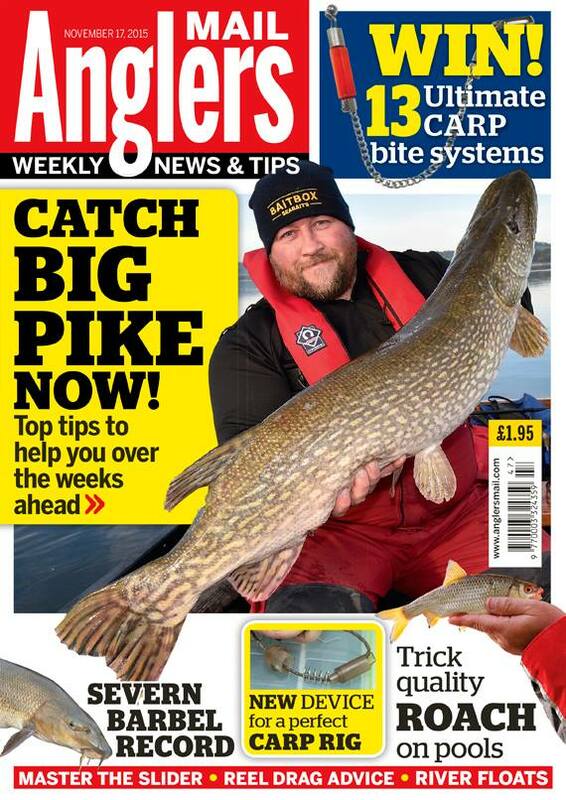 One of my recent articles in “Angler’s Mail” was listed on social media as “Pike ace Andy Black explains how to attract the big ‘girls’ by getting the best from large, soft plastics!” now how do they expect me to live that one down?? As you can imagine I then had a various soft plastics and big girl photos plastered all over my locker and desk at work! But at least I wasn’t upstaged on the cover this time! 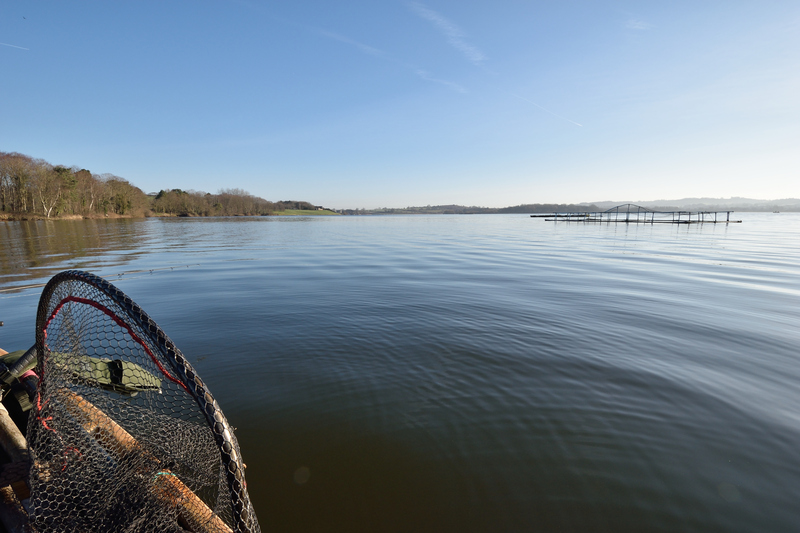 The next week at Chew was a real ball-breaker, with most anglers blanking. So what happened? Well, firstly, I always forget that the second week in February is predictably pants at Chew anyway. Secondly there was a severe temperature drop, though the water temperature wasn’t overly cold, on my finder it read 7 – 6.5 degrees for most of the time, so the fish should have been a bit more active. What I think happens is on the first week a few fish get caught, a few get pricked and they turn off for a bit. At the same time lots and lots of bait goes into the water. You only have to think that of the 40 boat anglers a day throw in 10 baits a day that is 400 baits sitting on the bottom, multiply this by 7 days and this is 2800 baits sitting on the floor of Chew. Now you would think that with the number of pike in Chew that they would soon mop this up, right? Maybe – maybe not. 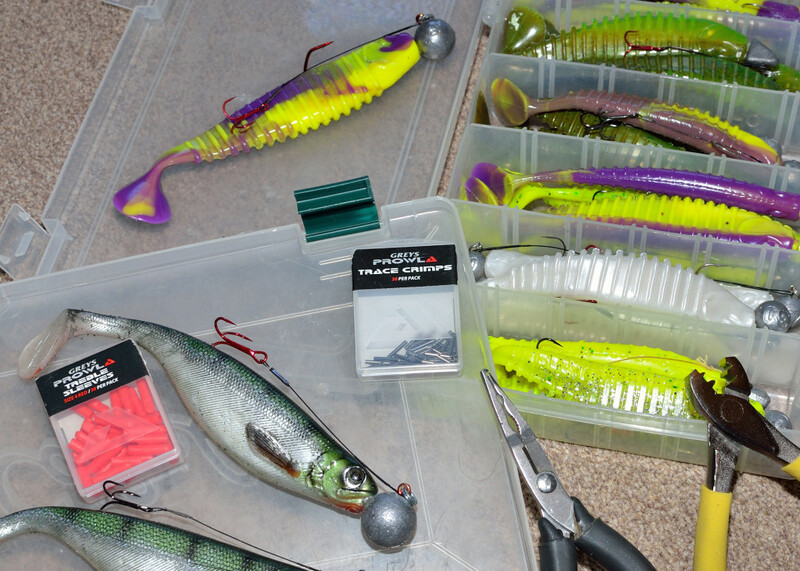 Throw in a temperature drop and a lowered metabolism and a pike might only want one or two of these baits in the whole week! No wonder the second week is rubbish! 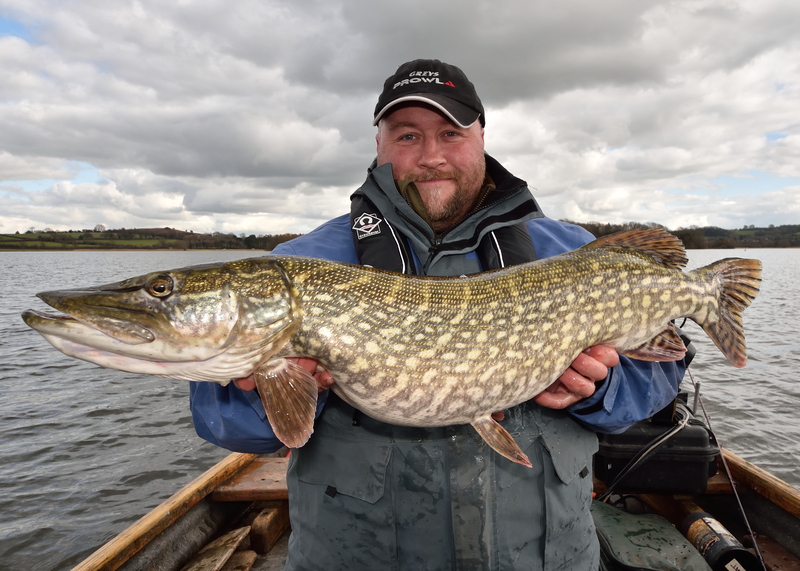 Now I am a great believer that even if a pike is stuffed to its gills and doesn’t want anything else, you can still tempt one on a lure if you annoy it enough. So that’s what I did, and managed to get a few as well. Though I had numbers of fish I struggled with the size. I was seemingly fated to catch 18lbers! You have to be careful a Chew though as the fish are so stocky, Paul nearly unhooked a 22 at the side of the boat thinking it was another 18. I did the same twice – it was only as I chinned the fish out that I realized they were heavier than I thought, and I could have let a couple of twenties go without a photo! Which is so blaze’ it is shameful! And that was that as far as pike fishing goes, with the exception of a couple of trips to the other water which didn’t result in anything I suspect with the warm conditions I most of the pike have their spawning heads on and it’s time to leave them alone for a bit and get some proper zander fishing done before the end of the season.